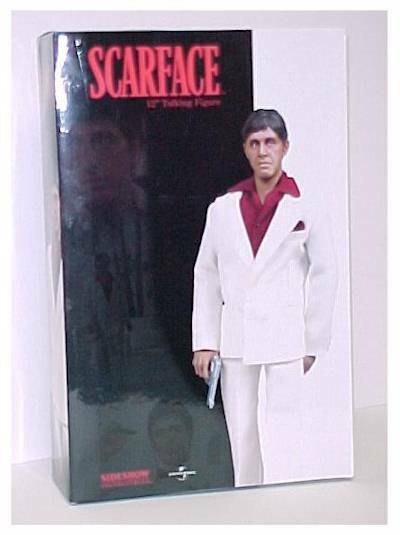 Mark D is back tonight with a guest review of the new 12" talking Scarface from Sideshow Toys. What's the scoop, Mark? 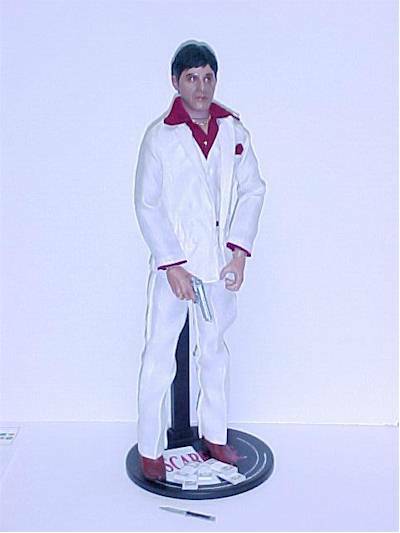 This is Sideshow Toys' talking 12" version of Tony Montana, AKA Scarface, as played by Al Pacino from Brian DePalma's 1983 cult classic film "Scarface". The film is about Tony's rise from Cuban refugee, to cocaine kingpin, and the hard fall due to his arrogance, paranoia and drug use. The film is a classic "guy's movie" and this was a "must have" for me when I first saw its announcement. The figures come in two versions, the standard release figure and the Sideshow Exclusive figure. This review is for the standard figure. If you've ever read my reviews before, you know that boxes are nothing more than functional transportation vessels to me. I immediately rip them apart to get at the goodies inside. However, this box does feature great graphics and photos, and a flap style box that allows full viewing of the contents. The color scheme and layout is meant to duplicate the Scarface movie poster. For those collectors that like to keep the boxes, this figure and accessories are easily removed and could be easily returned. The head sculpt is great. 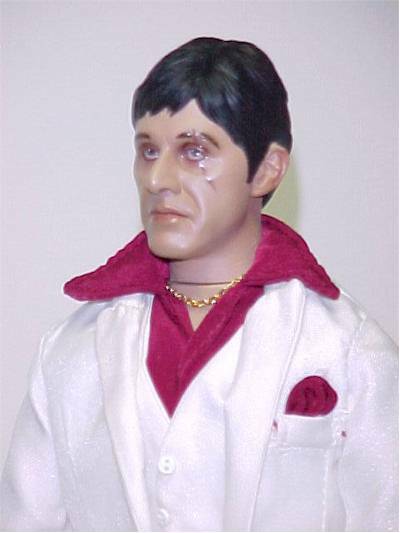 It is a great sculpt of an evil drug kingpin. Why only 3 ½ stars if I like it so much? 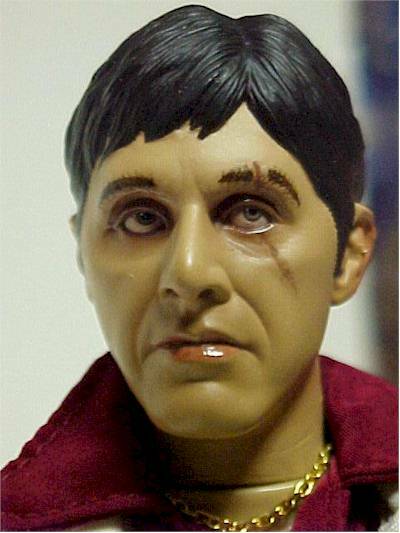 While it's an incredible sculpt, I really don't think the sculptor, Andy Bergholtz, 100% captured Pacino's image. There's no doubt who this supposed to be, but I just don't think it's the dead-on likeness like we've come to expect from Sideshow. I still really, really like the sculpt though. The head is and hands are the only things that are really painted. Sideshow did an overall great job on the head. The edges are crisp and the blending is smooth. The eyes are EXCELLENT. The gloss coating and shading around the eyes really give the look of a tormented, villainous thug whacked out on cocaine and power. The right hand appears to be a new sculpt and features a ring on his finger. The paint ops are smooth here as well and feature Tony's heart tattoo on his hand. Sideshow has articulation that is comparable to the other top figures on the market. Sideshow lists Tony as having 30 points of articulation. The joints are very solid, if not a little stiff. One thing that I noticed though is that instead of a ball joint neck like most Sideshow figures, Tony's head is mounted on the body. This allows left & right turning only, limiting his poses. My guess on the change in necks is that it is probably due to the talking mechanism taking up space in the body. In the past I've rated my Sideshow figures at 3 ½ stars in this category. I considered lowering my score because of the neck but decided it didn't affect the figure that much. Overall it is a very poseable yet stable figure. 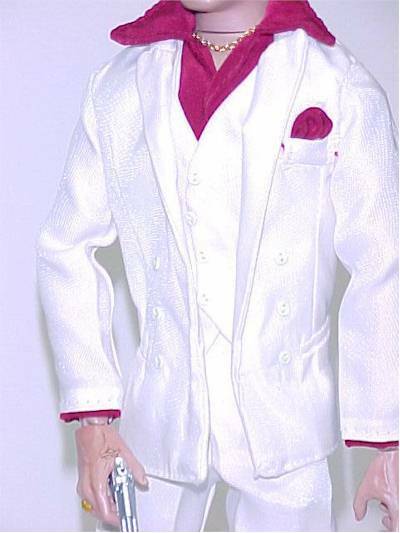 The figure is clad in a great 3-piece white suit. The material has a certain sheen to it, which I'm guessing is to simulate the satin or sharkskin suits Tony would wear. He's also wearing a wide collared red shirt beneath it. The whole ensemble goes together nicely. The tailoring is excellent on the suit. The shirt collars are bit thick but it's still nice. Tony's also got a gold chain and some half-boots that are nicely done. 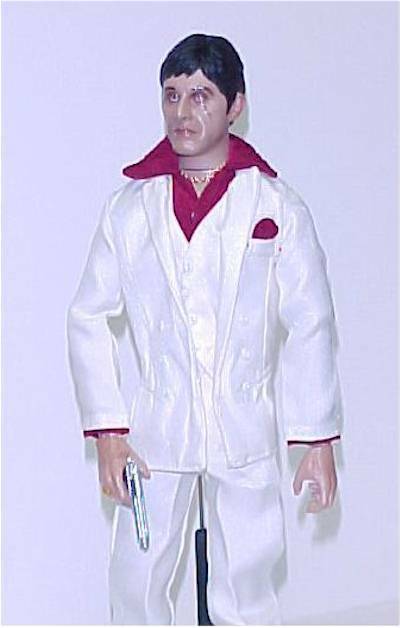 Tony comes with the traditional Sideshow stand, an M-92 pistol, a switchblade and four bundles on cash. All of the items are nicely detailed and fit in nicely with the figure. I always rank the figures on this category because after all, it is supposed to be a toy. This figure is more suited to striking a pose on a collector's shelf than it is riding an avalanche down a back yard log pile in a child's adventure. The Sideshow figures are overall pretty sturdy, especially when compared to some of the other high-end figures but they are obviously meant to be displayed and not played with. · Why don't you try sticking your head up your *** - see if it fits. · You got good stuff here, class A ****. 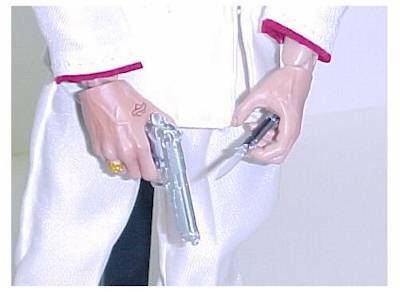 · I kill a communist for fun, but for a green card, I carve him up real nice. · Chi Chi, Chi Chi, get the yeyo! · This country, you gotta make the money first. Then when you get the money, you get the power. Then when you get the power, then you get the women. · All I Have in this world is my ***** and my word, and I don't break 'em for nobody, understand? · I bury those cockaroaches! · Maybe you can handle yourself one of those first class tickets to the resurrection. · This is paradise, I'm telling you. This town like a great big ***** just waiting to get *****. · I never **** anybody over in my life who didn't have it coming, you got that? · **** Gaspar Gomez, and **** the ******' Diaz brothers - **** 'em all! I got him on line for $15 from an e-bay auction. YES!! $15!! At this price he was a steal. Most online dealers are selling him in the $30-45 range, which is also a pretty good buy for a Sideshow figure. 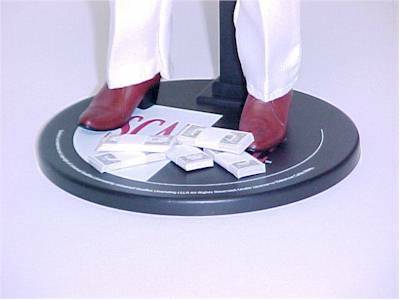 Non 1/6 collectors may think this is a high price, but it's on line with today's market. This figure is a great addition to my collection. I already have a spot picked out for him on my "Bad Guys" shelf. 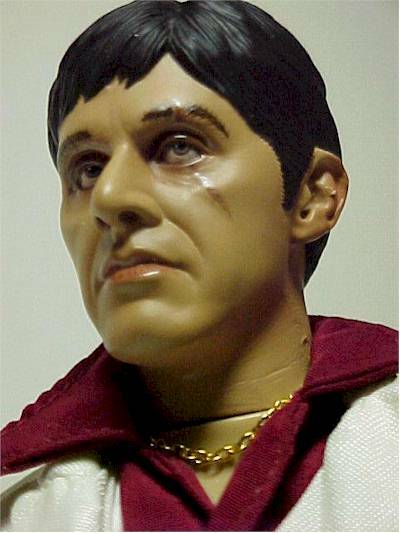 He'll be grabbed up by the cross market of 1/6 scale enthusiasts and "Scarface" enthusiasts. Figure from the collection of Mark D.